Am I weird for making a stationary wish list? Anyone else have a thing for cute and pretty stationary that's probably really impractical? Basially, I've always been quite an artsy and creative person. I always loved art and design at school and now I express my creative side through my blog and photography, although I do occasionally like to paint! I love all things home decor and desk decor and I feel like stationary ties in with that too. Notepads, pens and pencils can make pretty decorations and props for your desk to make you look like your a super productive human with your life put together (even though you are so not!). It is no secret that basically every blogger loves copper. I am no exception! The current theme of my bedroom involves a lot of copper accessories... I just can't get enough! This mini copper fan will not only keep my cool at my desk but will also look super cute! It's USB powered which means I could use it wherever I am (this would've been so handy in the library during deadline period!). Plus, it is only £6 from Wilkinson, what a bargain. The copper monthly planner pad from kikki.K has been on my wish list for a loooong ol' time. You may or may not know that I obsess over all things organisation and this desk planner satisfies all my organisation and planning needs! It's such a good idea to have a big sheet of paper that highlights your week right in front of you. Also from kikki.K, a little jar of round copper paper clips. I don't really use paper clips but I mean... they'd look so nice on my desk along with all my other copper accessories! So much prettiness. On the other hand, a stapler is a desk essential. I use my stapler a lot and therefore buying a acrylic copper stapler is justifiable - right?! Pretty and practical... I'm so selling this to myself! On the other end of the metallic colour spectrum we have gold. I do like pops of gold here and there so these stationary bits will fit right in! First things first, this gold foil pencil set by DotCreates. I've seen her shop on Twitter and Instagram and am loving how it is aimed towards bloggers. That's how you know it's going to be aesthetically pleasing! These pencils have cute little sayings on them, which makes them great blog photo props. Who uses pencils for writing with nowadays anyway?! Striped gold tape - yes please! I think this would look so lovely when used to tape prints to the wall. I've yet to buy frames for the prints I currently own so gold tape would look fab instead. These grey brush stroked sticky notes would be perfect for scribbling down notes and reminders. Also matches with the whole copper and gold theme going on! The 'I'm Very Busy' diary caught my eye straightaway as I was browsing through the oh-so-pretty Oliver Bonas website! I am actually not looking for a new planner but I know where to look when I am! And last but not least... this palm botanical print from Cosy Prints! I was actually lucky enough to receive a few samples of their prints and already have a leaf printed one. However, how nice would it look to have a set of three prints framed above your bed or desk!? Highly recommend their shop if you are after inexpensive prints. 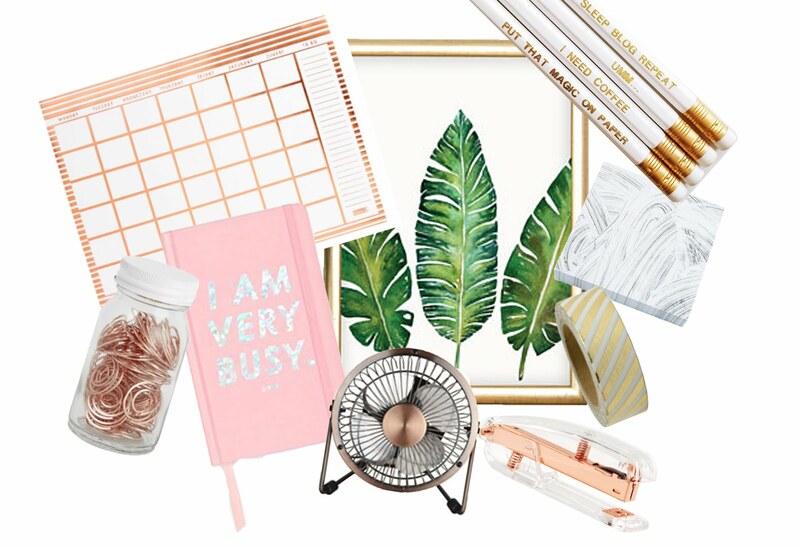 And there's my stationary wish list... what are you lusting over?